My press and public relations work always takes me to new and interesting places. Recently I was commissioned to take some hi-rise location photography for energy giants E-On. 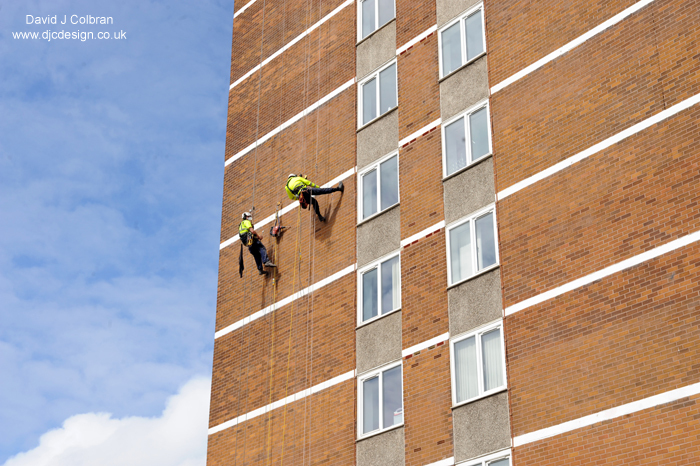 The project aimed to install cavity wall insullation on two hi-rise residential blocks in north Liverpool. And they worked with spcialists using a unique approach - by abandoning scaffolding and abseiling down the sides of the buildings instead. An E-On member of staff explains "Abseiling is a non-intrusive, cost effective way of being able to undertake the work. Using specialist techniques to anchor the ropes, the insulation engineers used a combination of weighted systems and anchor bolts. All employees had to undergo rigorous training to be able to qualify and reach the desired standard." They funded the scheme for local residents and a housing provider through its commitment to the Energy Companies Obligation scheme. Then once the holes are drilled, the insulation material is pumped in. My brief was to get images for two distinct audiences; press and then internal PR for both E-On, the housing provider and the specialist contractor. So a series of action shots of the various elements of the installation happening and then some team shots with key members of the project present. The action shots were taken at a series of angles and ranges, to show the scale of the project and the height of the towers. So if you are looking for a location press PR photographer, that is as happy coming up with great images out of doors as well as inside, give me a call to discuss your project. "David is an amazing Liverpool based photographer. Not just in his professionalism and demeanour, but in his clear understanding of how to create the best images for clients. We worked together on a number of commercial projects and it was quality both in terms of content and prompt delivery of files every time. Absolutely no problem recommending him, he is a true pro at what he does !"